10. Taco Bus – Everyone from college students to Guy Fieri has “discovered” the Taco Bus chain, which originated in a refurbished school bus. Now the five brick-and-mortar locations plus buses offer a range of Mexican hand-held wrappers that you can stuff with diced or shredded beef, beer-battered fish, even fermented soybeans. Also recommended: the butternut squash tostada. 9. Pane Rustica–This busy dining room offers flatbread pizzas, spectacular burgers, entrees such as acorn squash stuffed with chicken salad, and imaginative sandwiches on a choice of nine breads, all baked here. A changing mystery lunch entrée is the “Shut up and eat, don’t ask.” Save room for the bakery’s delish desserts. 8. Rococo Steak – No funeral home-turned-YWCA ever looked lovelier. Dating to the 1920s this building was recently converted into a steakhouse – the name refers to elaborate ornamentation – and a brewpub. The third-generation chef turns out both corn-fed and grass-fed steak options starting at 7 ounces, climbing to 22 ounces for a bone-in ribeye. The menu also offers Texas venison, Pacific oysters, creamed corn, and even quinoa and kale chips. 7. Maritana Grille– Not all beach restaurants are dive bars with sandy walkways. This dressy restaurant is the grand pink wedding cake that is a Florida Gulf coast landmark, Loews Don CeSar Hotel. The menu is big on fresh snapper and grouper with accents of the Med or the Floribbean (island and mainland). A solid wine list – with fine views from the bar, too. 6. Bella Brava – If it’s good enough for author Dennis LeHane, isn’t it good enough for us commoners? This trattoria and its horseshoe-shaped bar are just an open-collared shirt this side of fancy. The menu is to drool for: wood-fired oven flatbreads and pizzas, penne pasta with wood-grilled chicken, cotto ham, peas, roasted mushrooms and Asiago cream sauce. LeHane? The mystery writer lives about half the year within a mile of this downtown St. Petersburg restaurant. 5. The Refinery – Arguably serving Tampa Bay’s consistently best meals (Zagat named it the area’s best in 2012 and 2013), executive chef/co-owner Greg Baker – with three James Beard nominations – shuffles his menu every Thursday night, emphasizing locally sourced ingredients. He adds a French twist to Southern traditions, leavened with his 20 years in kitchens across America. 4. Bern’s– Founder Bern Laxer’s restaurant offers the best aged beef, organically grown veggies and a superb wine list numbering more than 6,800 selections, many by the glass. It is arguably Florida’s No. 1 steakhouse. Insider tip: Sample all of this for less than $30 by sitting at the bar and ordering the steak sandwich and a glass of the house wine. 3. Z Grille– Named for ebullient founder and James Beard-nominated chef Zack Gross, this downtown room is usually crowded and can be loud, but sitting at the bar facing the show kitchen is fun. The menu includes Mexican-influenced staples; trademarks are the deviled eggs (emphasis on deviled: the core includes some avocado, while the egg is lightly topped with hot sauce, bacon and jalapeno) and Dr. Pepper-sauced fried ribs. 2. SideBern’s – Created to relieve crowding at Bern’s, SideBern’s has taken off: Chef Chad Johnson was a 2012 semifinalist in the James Beard awards, while general manager Dean Hurst is considered “a superstar in national bartending competitions,” according to the Tampa Bay Times. Johnson’s menu is “modern Mediterranean” themed: starters such as oysters with a smoked shallot and oak mignonette, entrees including sweet and sour duck breast. 1. Mise en Place – Opened in 1986, it’s still ahead of most of the competition. Check the menu and consider the cornmeal-crusted oysters with green tomato chutney as a starter, followed by venison loin with rabbit chorizo palla risotto. Do get the favored side: lobster Manchego mac ‘n’ cheese. 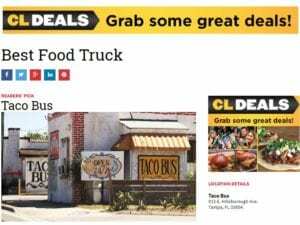 Buzzfeed has named Tampa’s Taco Bus one of the top 25 “Most Popular Food Trucks of 2013,” after a nationwide survey which selected food trucks from across the country. Taco Bus ranked 6th and given a rating of 9.2 out of 10. The website said visitors should try the “Butternut squash tostada and some horchata to wash it down.” The top-ranked food truck on the list was the Halal Guys of New York City, with its specialty of chicken and gyro served over rice with white sauce, Buzzfeed said. By JOHN O’CONNOR You may know Taco Bus for its street food standards with recipes direct from Mexico. Or, you may know them from their frequent appearances on the Food Network, Travel Channel or Cooking Channel. You may know Taco Bus for its street food standards with recipes direct from Mexico. Or, you may know them from their frequent appearances on the Food Network, Travel Channel or Cooking Channel. Taco Bus isn’t alone. The growth of food-centered cable channels has turned several Bay area restaurants into television stars. Food shows have featured at least two-dozen local restaurants over the past several years. Why? Well some of the reasons are obvious. Here’s Fieri again. Carlos Hernandez writes about restaurants with the nom de blog Carlos Eats. He sees two other trends working in the Bay area’s favor: An emphasis on local food and the still-recovering national economy. The Bay area is known for a handful of high-end restaurants. But Hernandez says you can also do high quality food with middlebrow appeal. “I think that perception is changing,” he said. I mean, I think when you look at food culture you have to realize there’s different types of food lovers. New York City has its own standards. If the menu’s not $300 then people aren’t probably going to eat there. Hernandez says the exposure is helping improve the region’s food scene. Rene Valenzuela – the owner of Taco Bus – agrees. The exposure has changed his business. But that first appearance — on “Man Vs. Food” in 2011 – almost didn’t happen. The show’s producer told Valenzuela they were featuring food truck on the East Coast, in Texas and in California — with the challenge in California. So Valenzuela was happy to show off his beef kabob taco recipe on national television. Taco Bus has expanded to five locations the past two years. But a TV appearance alone isn’t enough. “Now if the question is, that if the Food Network made a difference?” Valenzuela said. “Well it brought a lot of sales, but I also know other people that the Food Network came to them and they had these huge sales the month or two that follow it and then that’s it. So they promote it like ‘Oh, we were on the Food Network.’ But that doesn’t pay the bills. Valenzuela says he was most impressed by Food Network host Guy Fieri, who ran the Taco Bus shoot like a quarterback. By Fernanda Beccaglia The Taco Bus started as a food truck on Hillsborough Avenue. The Taco Bus, where “broken English is perfectly spoken,” is one of the most beloved food trucks in Tampa with enough locations to feed and please the hungry crowds. Make no mistake, this is no Taco Bell. The Taco Bus started as a food truck on Hillsborough Avenue. The Taco Bus, where “broken English is perfectly spoken,” is one of the most beloved food trucks in Tampa with enough locations to feed and please the hungry crowds. Make no mistake, this is no Taco Bell. This Tampa-based eatery has become the place for fresh, quick, Mexican food. It started as a food truck on Hillsborough Avenue. Then, last year, it was St. Petersburg. And in January of this year, the Taco Bus got its first storefront location on Franklin Street. Everything is cooked fresh from scratch. No canned tomatoes or pre-diced onions either. No stock or lard are used in their recipes and their tortillas are salt-free. Taco Bus delivers traditional, real, fresh Mexican food beyond any Tex-Mex you might have had before. Chef Rene Valenzuela, owner of Taco Bus and Taqueria Monterrey, grew up in Mexico savoring Mexican street food and delivers accordingly, to make sure the flavors, freshness and tradition continues in Florida by adding creative touches, using more elaborate flavors including beef tongue and braised beef and some recipes are based on ancient Mayan recipes. Great affordable, health-conscious menu that includes vegetarian, vegan and gluten free options. Their Agua Frescas are made with raw fresh fruit. The butternut squash tostadas and the cochinita pibil tacos. Their menu features daily specials, favorite and popular classics, and a variety of delicious and fresh selections of vegetarian, vegan and gluten-free options. So if you find yourself craving beef tongue tacos in the middle of the night, Taco Bus is open to satisfy every one of your cravings. The St. Petersburg location of Taco Bus was named an Outstanding Business of the Year as part of the 2011 Florida Main Street Awards. The awards program recognizes accomplishments on local levels that advance the goals of Florida Main Street, a state technical assistance program. The St. Petersburg location of Taco Bus was named an Outstanding Business of the Year as part of the 2011 Florida Main Street Awards. The awards program recognizes accomplishments on local levels that advance the goals of Florida Main Street, a state technical assistance program. Tampa Electric Co. was also recognized in the Outstanding Private-Public Partnership category for its work with Dade City.